Award winning Dermal Filler treatment practitioners, Suffolk Medical Clinic. The conscientious, award-winning team at the Suffolk Medical Clinic are delighted to have been presented with the prestigious WhatClinic Customer Service Award for the 3rd consecutive year. 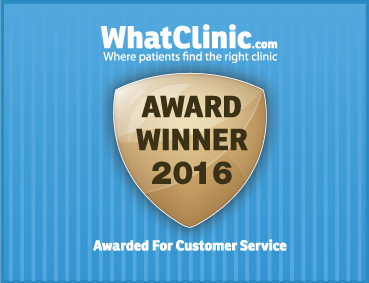 This award acknowledges excellence in customer service and shows that the Suffolk Medical Clinic demonstrates a clear and measurable commitment to their clients, meeting the highest standards for customer care – something of which they are very proud to have achieved. Suffolk Medical Clinic technicians are qualified dermal filler treatment practitioners for Suffolk and Essex, find out more on the link here.